servant, also a war casualty. This was the gigantic organ in the Congress Hall at Nuremberg. While the Atlantic City organ is undoubtedly the largest in the world, this German giant held the honour as the largest instrument, which was not segregated or divided in any way. The 16,013 pipes were all hidden away behind the rather effective pipe-rack. It is interesting to look back on the building of this organ's predecessor. On August 2 ist, 1935, the notorious Martin Bormann asked the firm, of E. F. Walcker & Co. of Ludwigsburg, to send a representative to discuss the building of an organ for the Luitpold Hall for the Party Congress at Nuremberg, which was to be held later on in the year. The enormous size of the Hall, which was some 5goft. by igyft, required an organ with at least fifty to sixty speaking stops. The difficulty was that the instrument had to be ready for playing by September and. I don't know whether any dire threats in typical Nazi fashion were used, but Walcker undertook this almost impossible task, and by August 2 8th were able to tell Bormann that an organ of fifty speaking stops would be ready on the appointed date. The specification included several chorus reeds and a five-rank cornet and appears to have been designed principally for noise. 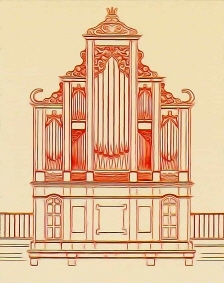 The twelve following days were spent in transporting, erecting and tuning the organ. Though a little late, it was played for the first time by Eduard Kissel at the " Parteitag " (the day of the N.S. Party). This organ, however, proved to be too small for the large new hall under construction^ and so it was decided to build a bigger instrument, which might eventually be re-erected. In the Spring of 1936, several organ builders were requested to tender for an organ of the desired size. The final choice laybetween Steinmeyer and Walcker. who were the only two German builders in a position to cope with such a large contract. 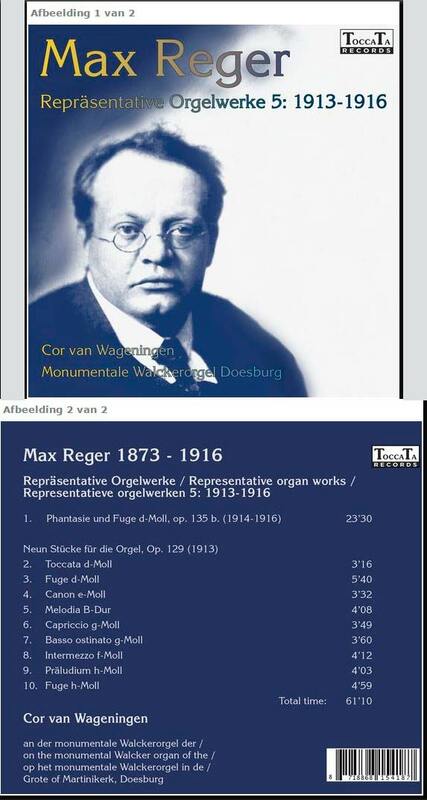 Tht American Organist, in giving the stoplist in their journal sometime ago, suggested that, as Steinmeyer's wife was an American, the contract went to Walckers. Perhaps so, but Walckers have been building organs since 1781, and I do not think that this contract necessarily displayed sympathy to the Nazi gang. The firm of W. Sauer of Frankfurt, who have Dr. Oscar Walcker as a director, collaborated over the tremendous task. Senator Franz Adam, the conductor of the N.S. Reichs Symphony Orchestra, specified the following points :—The organ must be designed in such a way that the quality does not suffer in any way when transmitted over an amplifier system. The purpose of the organ will be to support the orchestra and to accompany the singing of mass meetings. Because of the large size of the Hall, the organ will largely be heard through loudspeakers. As practical experience over a number of years has shown that amplifying systems multiply the difference of the intervals of the tempered tuning (fifth, third, etc. ), mixtures and mutations will have to be modified. Instead special attention must be paid to diapasons and reeds. Allowance must be made for the possibility of enlargement, if the organ is to be used as a concert instrument in the new Congress Hall. The immense range of the organ must not attract the attention of individual listeners because of artistic subtleties, but must bring out the spirit of the Reichparty. (! !)Dr. Oscar Walcker and Dr. Eduard Kissel together worked out the specification which appears on pages 86 and 87. PEDALwERK.—There was only one botrowed stop on the organ, the acoustic 64ft. The remainder was entirely straight. With so few flue stops of i6ft. pitch, there might have been some duplication of certain manual doubles with good effect. The abundance of upperwork must have put the pedal couplers to little use. The reed chorus of 32ft. to ift. pitch was ample for trumpet and tuba tones. Perhaps Franz Adams's fifth clause forbade the inclusion of quiet Basses for cor anglais and clarinet. Enclosure of certain ranks in the schwell-werk and hornwerk boxes was a useful provision. KRONWERK.—This department, of which the pipework crowned the remainder and thus got its name, was not exactly a positif but a miniature of the hauptwerk. The tutti was designed to produce a brilliant sparkling chorus and probably did. As with the other manual departments, a 2ft. reed was provided. No indication in the descriptive brochure is given as to how far up the reed pipes go before the change to flue pipes. The viola served as the only string in this department, while there were thirteen flutes not including mutations of this timbre. In Germany, the tremulant is not necessarily confined to enclosed divisions and one served in this department. HAUPTWERK.—This great organ solicits no comments as it was typically German in specification. Though only three unison diapasons, there was a profusion of flutes of all pitches. Reeds were all rather small. Power was obtained by many medium-scaled ranks speaking in a very complete chorus. OBERWERK.—The normal swell department. Twenty-six ranks had an extra octave of pipes for use with the octave coupler. The Bratsche was a gentle string which had the vox celestis as its undulating partner. scHwELLWERK.—According to the brochure, this department was the solo. All ranks were enclosed. Obviously with so much mixture work, the whole must have been designed to produce some sort of ensemble. HORNWERK.—With reeds of twenty inch wind pressure lying horizontally and directed into the Hall, this department produced the climax and would be equivalent to our bombarde. Perhaps it was the hornwerk which fulfilled Adams's fifth point! tone; only fifteen stops and many of these were of gentle dulciana and salicional quality. There was also no septieme, which is an important harmonic in string tone. Unlike the French though, the Germans have never been too keen on string tone and this instrument had an abundance of every type of flute tone. ',Wind pressures varied from 6 to 20 inches, but, apart from the feldtrompeten, most of the pipework spoke on relatively low pressures for so large a building. There was no case to this organ, but it had a most pleasing pipe-rack. Thr single wooden pipes, which formed the two towers, belonged to the 32ft. tibia major, wide the flat between was composed of bombarde pipes of the same pitch. Such long boots must have caused considerable delay in speech and release. The flanking flats were formed from pipes of the prinzipal bass and grossnasat. On October 26th, 1936, Eduard Kissel opened this organ in four public recitals before an audience of between four and five thousand people. The occasion also marked the 2,500th organ built by the Firm of Walcker after their establishment of 150 years. The life of this instrument was but a few years though, as both organ and the building, in which it was housed, were totally destroyed during the heavy raids on Germany. More was the pity, because, being Nazi property, it might well have been confiscated and eventually rebuilt over here in Earls Court or some similar hall where it would have begun life afresh under democratic fingers. Of the two builders, the firm of W. Sauer are the less known. They were established in 1857 and have since built some 1,600 organs. 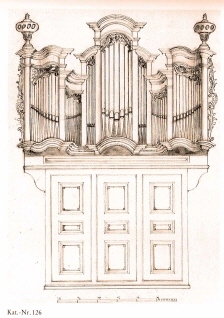 Sauer, who worked for Walcker for a while, studied organ building under Cavaille-Coll in Paris. He then tried to transfer his French experience to German organ building and thus his instruments have been more satisfactory for rendering French music. This influence does not appear to have predominated in the organ in question however. Messrs. E. F. Walcker & Co. built a tremendous number of organs before the war, and many of the larger ones have been described in past issues of The Organ. The Works in Ludwigsburg escaped damage during the war, but many of their records were destroyed in a store elsewhere. Business was carried on as usual and some hundred-and-ten new organs were built. One of these arrived safely in Finland in 1941, while five others found their way through the South of France into Spanish churches. Since the war, Walckers have been chiefly engaged in building small unit organs for the many temporary churches which have been erected. There are five different models, of which the fourth has a distinct baroque flavour. Although having only three units, one is a small three-rank mixture which appears on each manual, but on the pedal as a six-rank mixture! Die Elektropneumatik bei Walcker [2.015 KB] - Vortrag gehalten im Jahr 2013 bei der VOD, hier als PDF mit allen Bildern in recht guter Auflösung. 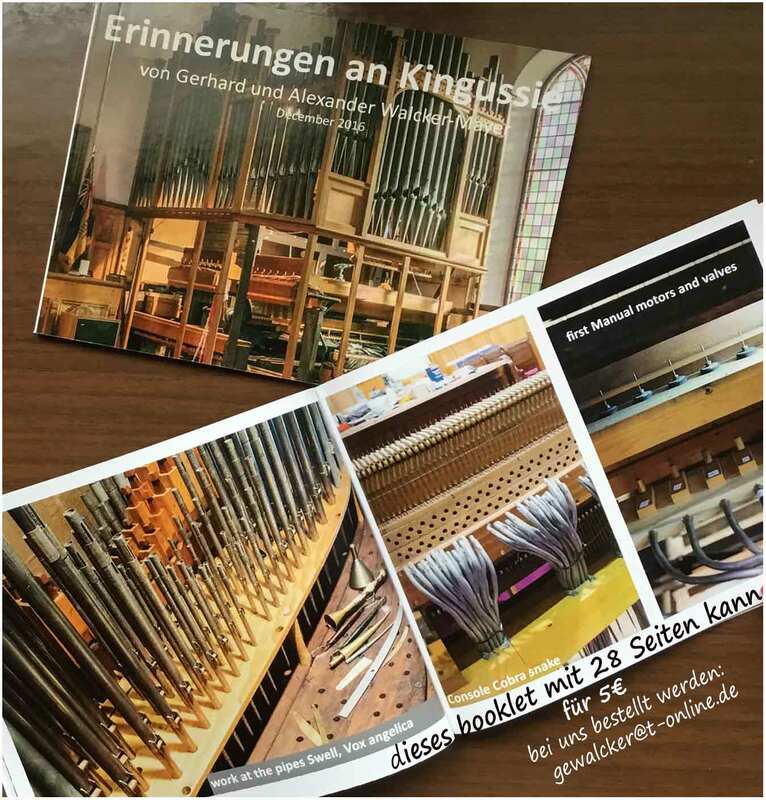 Lohnt sich der Kauf von "Roland Eberlein, Orgelregister, ihre Namen und ihre Geschichte"? In meinem Blog vom 08.Sept. 2009 wird ausführlich erläutert, welche Möglichkeiten das Buch bietet und welche nicht. Jeder Vergleich von Naturklängen mit elektronischen Klängen geht fehl, weil das Naturtoninstrument sich fortwährend verändert und dabei doch eindeutige Identität bewahrt, besonders die Orgel. Während die elektronische Klangerzeugung beliebige Zustände erzeugt und dabei Identität nur im Hörer schafft. Die Industrie-Technik selbst ist subjektfrei. Drei E-Orgeln, egal ob von Böhm, Wersi oder Rogers, sind eben keine 3 Subjekte. Bei der Orgel ist jede einzelne Pfeife ein subjektiver Klangerzeuger. Der entscheidende Unterschied zwischen Natur und Technik liegt in der Subjektivität begründet. Seele, egal wie immer man sie definieren will, sucht Natur und damit Subjektivität.